After our delightful brunch at the Wildflower Cafe, I was keen to see the famous Portobello Road markets and our daughter Mlle was equally keen to show me round what has become another of her favourite haunts. Strangely Monsieur Le Chic did not share our enthusiasm and after a pleasant 10 minute or so stroll down Westbourne Park Road, which lands you in the heart of the market area, he beat a hasty retreat in search of an underground station to take him to a far more important commitment – Tottenham Hotspur’s latest home game! Wandering past the elegant Regency style terraces, which abound in this part of London, makes for an enjoyable activity in itself! It almost came as something of a shock when we reached the corner of Westbourne Park Road, where it intersects with Portobello Road going from north to south. 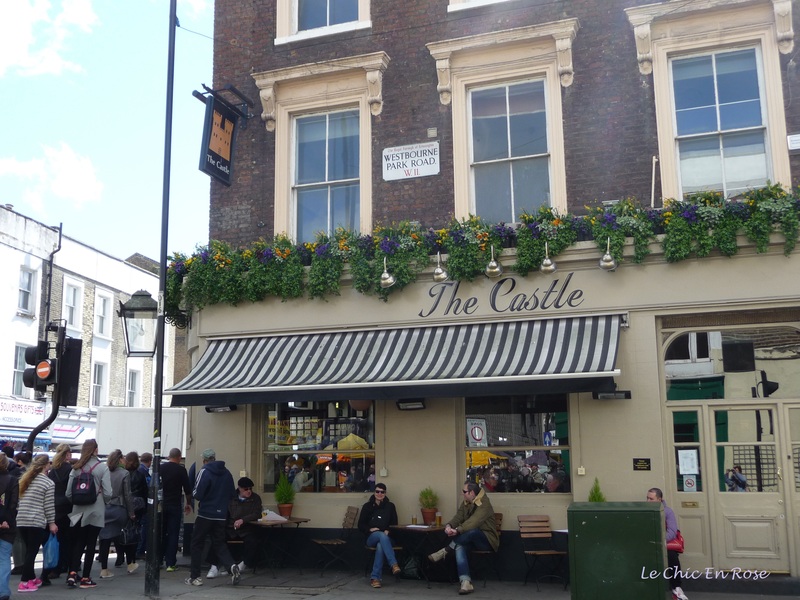 Suddenly you are in the midst of a heaving throng of people, tourists meandering along, locals doing their weekly shopping, market stall traders yelling out the latest deals or people having refreshments at the nearby Castle Pub! As I explained in last week’s post, my previous knowledge of the Notting Hill area was mainly confined to the film, “Notting Hill”, a rather improbable love story between a world famous movie star, Anna Scott, (played by Julia Roberts) and William Thacker, a travel book store owner in Notting Hill, (played by Hugh Grant). Practicalities of plot aside, it was an enjoyable film and you can still see some of the location settings in the Portobello Road area. 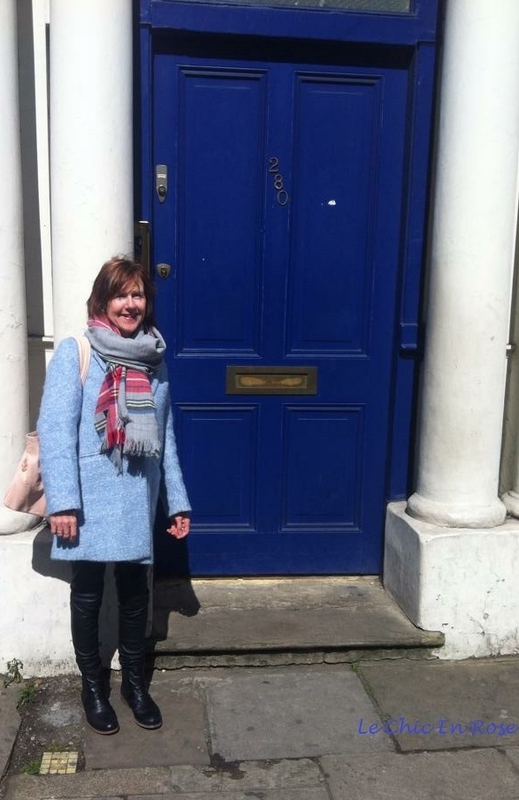 The entrance to William/Hugh Grant’s flat was a bright blue door and if you go to 280 Westbourne Park Road you can find the original facade (it was actually the home of the film’s screenplay writer, Richard Curtis, though he has sensibly moved out now). If you are quick you can get your photo taken before another lot of tourists jumps in! I was actually very lucky to have a local guide in Mlle! One thing that struck me is how much narrower the streets were than I’d imagined them to be. At the start of the film there is a sequence showing the Portobello Road markets throughout the year with the changing seasons. No doubt with camera tricks, it made the road seem a lot more spacious than it really is. Mlle was able to guide us through the crowds to 13 Blenheim Crescent, a side street off the main drag where you can find the Notting Hill Bookshop. The current shop isn’t in fact the original travel book store as that closed down a few years ago, but they have kept the exterior the same. Filming the interiors took place round the corner at what is now a shoe shop in Portobello Road. 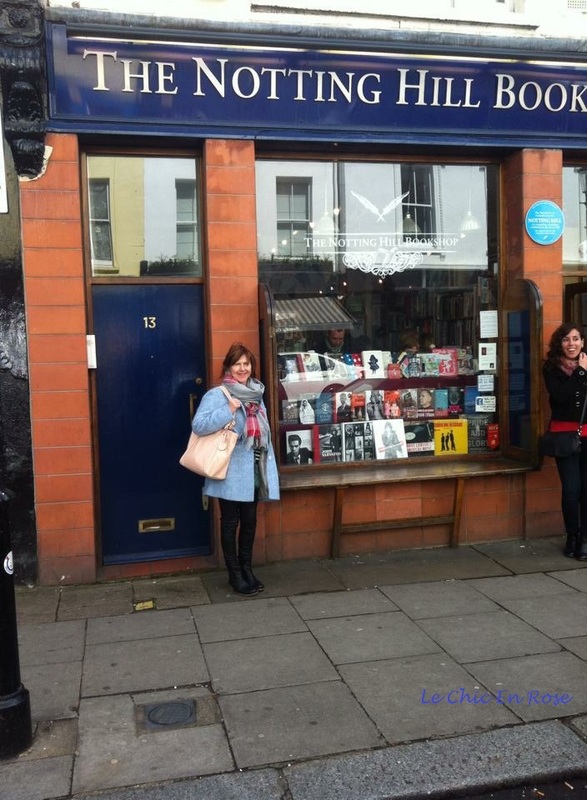 However since the original Travel Bookshop was the inspiration behind the film plot, the current Notting Hill Bookshop remains to this day a highly popular location on the film tourist trail. I was able to pick up a travel guide to Munich and Bavaria there – they had an excellent travel section though they also sell plenty of other categories of books as well as some souvenirs and stationery. Of course the other main reason for our visit was to browse round the countless market stalls and independent shops in the area – Portobello Road has arguably one of the best known street markets in the world and it celebrates its 150th anniversary this year. The Portobello and Golbourne Road Market blog has some interesting information about the markets and events planned for the birthday celebrations here. Most people probably associate the markets with antiques, although they also cater for fashion lovers, book collectors, musicians, and of course supply a huge range of fresh food and flowers. You could spend days here and still not have seen half of what there is on offer. Although some sections of the market open during the whole week, the full market is only held on Fridays and Saturdays with the latter day being the busiest. Stalls stretch for over a mile along Portobello Road and spill over into nearby Golbourne Road. We loved the beautiful colours of the tulips! We headed for Portobello Road Cigarette Cards, which you can find at Street Stall 42, 142 Portobello Road see here for details. Mlle had been coveting a print made up of old cigarette cards – illustrated from the first edition of Alice In Wonderland. The print was still there so we duly purchased it. David, the owner, was a gregarious chap and we spent quite a time chatting to him about the origin of the cards. It was the fashion in America in the late 19th century for cigarette companies to have sets of cards in their packets and the attraction spread across the Atlantic to Britain. Collecting the full set of each cigarette card theme became a popular pastime. We were intrigued by the Alice In Wonderland set as it seems strange today to think of small children nagging their parents into buying more cigarette packets so they can collect the cards inside! Mlle’s purchase was particularly apt as there is a special family connection with Alice In Wonderland. One of my most treasured possessions is a first edition copy of Alice In Wonderland passed down to me from my grandmother via her grandmother! David is a member of the Portobello Road Antique Dealers Association, who must adhere to a strict code of practice if they wish to keep their licences. Portobello Road is an antique lover’s paradise – shop after shop displaying wonderful trinkets and treasures alike. 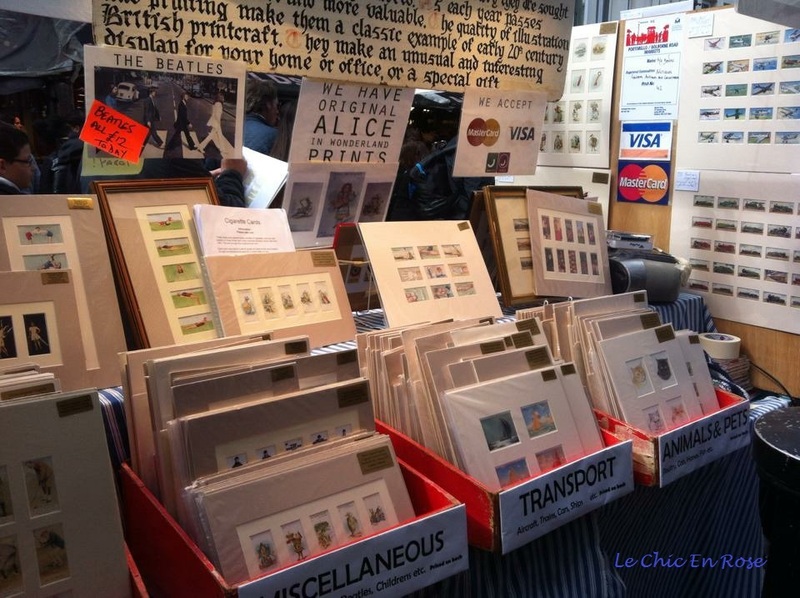 Furniture, clocks, collectables – it was quite overwhelming! Amongst the rabbit warren of interconnecting passages we came across Sara Tiara, a ladies’ boutique specialising in bespoke hats. The designs were truly works of art though taking photos was unfortunately strictly forbidden. However I did take away a business flyer with me so I’ve taken a couple of photos to give you an idea of the exquisite hats available. I didn’t take too many photos as we wandered round the streets. The one thing you do have to be aware of in such a confined and busy space is the potential for pick pockets – I didn’t want to be having to open my bag up too often or be seen rummaging around in it for my camera. Mlle and I did get hassled at one point by a lady who seemed to think we should buy a shopping trolley off her, but she quickly disappeared to pester someone else when we waved her away. Most of these photos were therefore taken on my or Mlle’s iPhones. I kept cash in my cross body purse and held on to my tote bag tightly! After an extensive browse in the charming Appletree Boutique, another of Mlle’s favourite clothes stores, we set off towards the tube ourselves as we were heading off to a matinee performance at the Victoria Palace Theatre London (Billy Elliot – great show, well worth seeing!). Alas we didn’t have time to stop off at Portobello Road Gin but Mlle assures me they do wonderful albeit rather strong gin-based cocktails! Portobello Road makes for a wonderful day out – vibrant, colourful and with plenty of food stalls to refresh weary shoppers, it is a fabulous experience all round! For more inspiring walks around the world head over the Restless Jo’s Monday Walks! I did enjoy our wander, and especially the lovely flowers. I would have liked to see a photo of the Alice prints but maybe you didn’t include those because it’s a first edition (and copyists?) 🙂 Glad you’re enjoying your time with Mlle. The market sounds like such fun! I’ll need to add this experience to my list! It’s the food stalls that would draw me in! I haven’t been to this market, but I have been to Borough Market which (I think) is all food. It was moth-watering – but, like you, we were in a hotel and couldn’t buy much. We do get markets here, but nothing lie as good as that. I love markets anywhere – they are just a lovely concept and I’d far rather go there than shopping centres! This part of London is really charming, I love it ! And the weather was beautiful. The hats look amazing ! I can understand why they don’t want people to take pictures. The pictures can end up on internet, other people will still the design, etc etc. Wow Rosemary, I want to retrace your footsteps and do all of this – after watching the movie first!! It just looks so vibrant and fun – you were so lucky to have all the insider take as well from your daughter. Billy Elliot sounds like the perfect end to a perfect day. I saw the movie a couple of times but a long time ago Rosemary so you’ve inspired me to watch it again and I’ll be following your tips next time we go to London, we like exploring different areas and I think we’d all love this one. It’s funny but we watched Billy Elliot last weekend, again I’ve seen it a few times but years ago, we watched it with our son and all enjoyed it, we even talked about seeing the musical in London so you’ve inspired us to get on with that too!! Have a great weekend, we’re in wet and windy Ireland while the rest of the UK has bbq weather – typical! It’s so lovely to be reminded of Portobello market. Your photos and description are so perfect – I used to live in Kilburn and would spend many weekends just wandering there and people watching. Hope you had a lovely weekend. 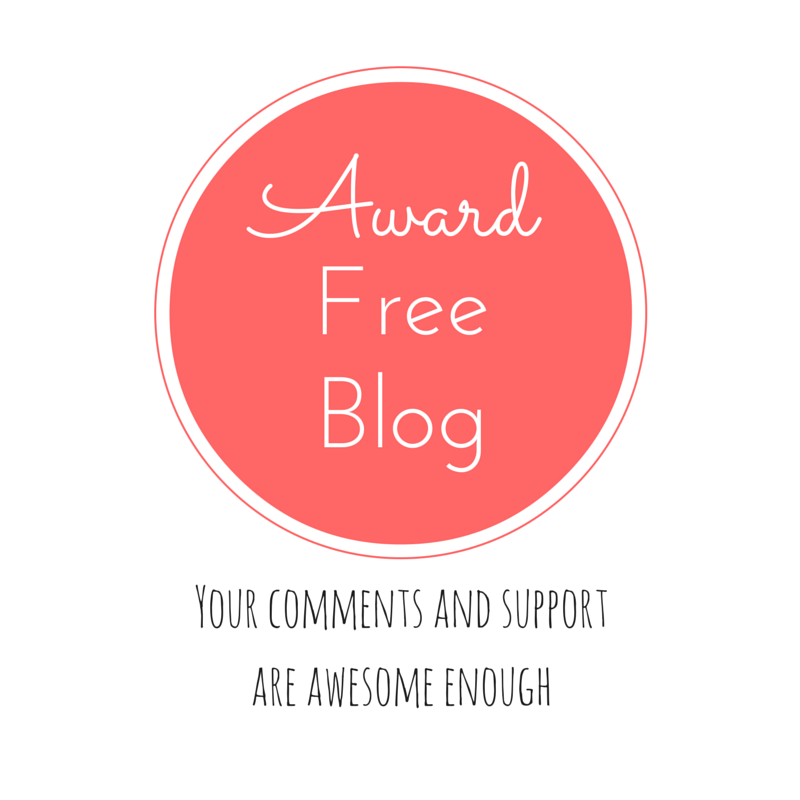 Popping in from Jo’s site to have a wander with you. I don’t think I have ever been to this part of London so it was nice to explore it. Love the houses! And love markets! A shame you didn’t have time to go into the Portobello Road Gin – I quite fancy a G&T – well maybe not right now, it is a little bit early, but I love finding unusual ones. Hello Jude am so glad you’ve popped in from Jo’s Monday Walks and thanks for the follow too – much appreciated! I loved the Notting Hill area, which I had never explored before. Our daughter had been to Portobello Road Gin with some friends a few weeks earlier and she loved it! Not time on our last trip so will have to go next time I think! It certainly sounds an interesting concept from its website and their gin gets a lot of praise from connoisseurs hopefully you can go there and try it out! What a great joy it was to see Your gorgeous photos. They brought to my mind memories dating back “hundred years” when we were there.